We're a small business software solutions company. We help small businesses. Financial forecasts are made easy with our cash flow forecasting software application. Our clients increase their sales and profits with our easy to use increase profit software solution…plus more business software applications. The best small business software solutions. Business software applications which include cash flow forecasting software, profit growth software, plus a guide and template to assist you to buy businesses. All of our Excel-based business software applications are built with the user in mind. Also, each software solution has been borne out from a real small business need. We’ve put the hours in, so you don’t have to. “Very pleased to have stumbled on this solution for cashflows – since the demise of sage’s winforecast we’ve made do with custom spreadsheets which always turn into a nightmare. This handled a quite complex budget very well and saved a lot of time (and at a fraction of the cost of a full software solution). I am sure that we will be using it a lot in the office when clients want forecasts. “It took only 10 minutes and I had a complete cash and profit forecast printed and ready for the bank, including balance sheets! “The template is excellent – very easy to use. You can produce a professional set of forecasts very quickly. You can spend your time producing accurate figures rather than trying to work out how to make the balance sheet balance with the cash flow forecast! “We can recommend the cash flow forecaster as being a very simple program to use, producing professional-looking reports, very reasonably priced and saved us many hours of work compiling our own initial spreadsheet. “I built my own forecasting program in Excel but got so many gremlins to fix so I gave up in the end. 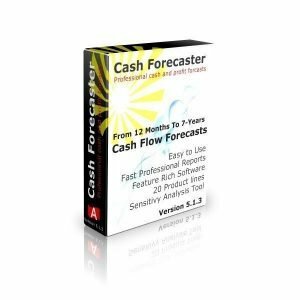 Bought the standard forecasting program from Cash Forecaster and it solved all my problems so I could focus on making financial forecasts instead. Works a treat, a friend entered my data into the Sage Forecasting program to see if there would be any differences in outcome. Of course it did not! Have since purchased an upgrade of the Cash Forecaster program. SAVE TIME: Save time setting up lengthy and complicated spreadsheets with our cash flow forecast software. AVOID EXCEL FORMULAS: Avoid complex Excel formulas. Instead enter numbers on easy to use Excel templates. SAVE MORE TIME: Save valuable time, as the professional forecast reports are ‘ready to go. AVOID WORRY: No need to worry whether your numbers balance, as a projected balance sheet is built-in. Plus a forecast profit and loss and Cash Flow Statement. STOP THE HEADACHES: Avoid headaches and lost time spent calculating which numbers to include on which forecast reports. GET FOCUSED: Having a focus or a target is the key to success in business. Increase Profit Software targets your key profit drivers. INCREASE SALES: Discover how to effectively increase your sales. INCREASE PROFITS: Discover your key profit drivers and how to effectively increase them. Determine which of your profit drivers have the most impact on your profits. For example: Is it your average transaction value or the number of times your customers return? Or is it one of your conversion metrics that has the biggest impact on your small business profits? BENEFIT FROM THE POWER OF LEVERAGE: Each key profit driver will increase your sales and profits on its own. However, when you combine the effects of a few or all of your key profit drivers, your sales and profits will soar. AVOID THE COST OF BORROWING: Use Increase Profit Software to increase profits and plug any cash flow gaps to avoid the costs of borrowing from banks. 50 KEY QUESTIONS TO ASK: When you are buying a business it’s important to ask the seller the right questions. 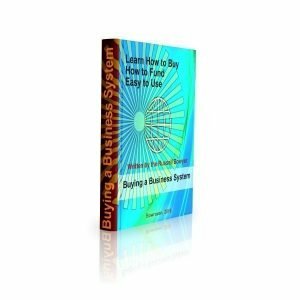 Included with the business buying template is a list of 50 key questions to ask the business vendor. DON’T OVER-PAY FOR THE BUSINESS: Determine the right price to pay for the business you are buying. Don’t pay more than you need to. DISCOVER ABOUT VENDOR FINANCE: Vendor finance is one way to leverage your business purchase. No money down deals are the best way to avoid costly bank borrowing. MAKE AN INFORMED DECISION: If you go armed with the right information and if you ask the right questions, your business buying decision will be better informed. REDUCE YOUR RISK: Your risks are reduced with the added knowledge and information you’ll gain from using this system and guide. : Your risks are reduced with the added knowledge and information you’ll gain from using this system and guide.